Shelley Carrol's latest CD is entitled I Heard That and features the late legendary Texas Tenor, Marchel Ivery along with guest appearances from Ardina Lockhart, Roger Boykin, Stefon Karlsson, and other Dallas area luminaries. 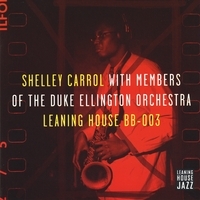 Debut CD from Shelley Carrol on from the critically acclaimed Leaning House Records! Featuring Tommy James, Sebastian Whittaker, Marchel Ivery, Barrie Lee Hall, jr. and more!